What type of madness would cause a perfectly sane person to voluntarily make themselves readily available for consumption by a possessed hulking two-headed mechanical worm-like creature? The answer: To feed it madness. In my Numenera RPG campaign the Paranoid Automaton, the PCs are given multiple options in dealing with problems that arise throughout the game. And for the most part, the easiest solution would always seem the least dangerous and most SANE option, except for a few adventures with one of them being the appropriately titled adventure “Feeding Madness to the Earth Devourer”- one of the last adventures in the chapter “Zelectran’s Spectral Festival of Sound” in my Numenera campaign. Without giving too much away, the PCs are tasked with bringing down a gigantic automaton worm-like creature, the Murdaunus, that’s wreaking havoc across towns and villages in the cold desert of Matheunis. For their efforts, the PCs are promised a valuable Holotab Atlas that will help them with the main adventure of the campaign. But, bringing down the alloy/synth-made Murdaunus is proving challenging, especially when it comes to stopping it by force where severe injuries and deaths are most likely to occur. At one point, the group learns of a strange oracle within a giant 100,000-year-old tree that tells them of a far easier and faster way of dealing with the seemingly-unstoppable and enormous earth devourer. The oracle telepathically tells them that if the sap of the tree it rests upon is injected within the interior spine of the Murdaunus, it will make the beast’s possessed programming insane and will render it harmless. The trick of course is to actually survive the consumption of one’s body by the Murdaunus, travel through its body (while maintaining sanity) and injecting the sap into the spine. Luckily , the Murdaunus’ main intent is to “collect” living specimens to be used as slaves for its mad project to create a facsimile of a long dead city along a cluster of lakes. Therefore, the chances of just losing a limb are far better than dying, and even those odds are lowered given the Murdaunus’ relentlessness of gaining more workers so that the construction of an odd and archaic city finishes more rapidly. 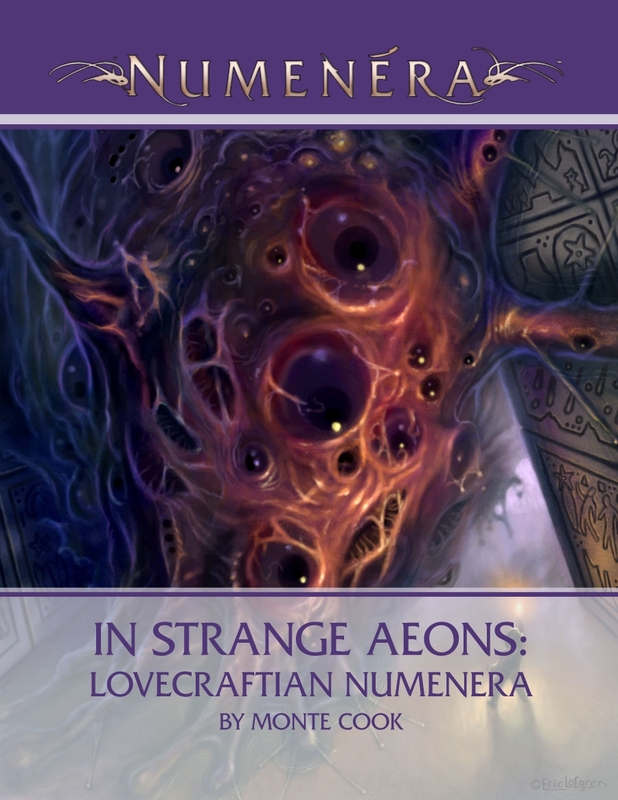 One short, but valuable, resource I’ve been using for this segment and others has been “In Strange Aeons: Lovecraftian Numenera” a resource PDF by Monte Cook that gives you rules, suggestions and some Cthulhu Mythos monster stats made specifically for Numenera. I purchased this awhile ago with another encounter in mind, but have used it in a few others since my campaign does have some gothic horror style elements. This resource essentially tells you how to deal with insanity in Numenera whether its by uncovering doomed knowledge, coming face to face with a horrifying creature or even the discovery of a cypher. Once the intellect pool drops to zero, that character is permanently insane and has to trade in his descriptor for one of two “Mad” descriptors which are quite cool and offer some perks, but with some of the expected traits of a doomed or mad person.